After the ISIS attack on Mosul and the Nineveh Plain in northern Iraq — displacing thousands of Christians and Yazidis, forcing them into camps all over the Kurdish area of Erbil, Dohuk, Sulaymaniyah and Zakho — there was an urgent need to intervene and provide medical support and attention to these people. In September, just three weeks after the displacement, the situation was miserable. CNEWA representatives who visited the region were shocked at what they saw, especially when it came to the medical care of the refugees. The only existing dispensary was a tent placed on the side of a street, with families waiting in line outside under the sun to get their medicine or their injections. This terrible situation moved CNEWA to install a prefab dispensary in Erbil, which has been successful through the support of its local partners. The Dohuk dispensary consists of ten rooms, including a waiting room, two quick checkup rooms, two doctors’ rooms, a lab, two small operating rooms, a pharmacy and a storage. All are connected by a middle corridor. The building is a prefab steel structure. The rooms are properly air conditioned and furnished. In early May, the dispensary received around 55 patients per day in addition to about 20 chronic patients; this adds up to about 420 patients per week, and that number is expected to increase to around 700 patients per week. The dispensary is under the supervision of a committee representing all communities — Assyrians, Chaldeans, Syriac Catholics and Syriac Orthodox. It is managed and operated by the Rev. Aphrem Philippos, representing the committee; two sisters from the Dominican Sisters of St. Catherine, who have great experience in similar projects; and a doctor. On the first week of May, the dispensary got the blessing of both Cardinal Leonardo Sandri and Msgr. John Kozar, who visited the facility as part of a pastoral visit. While I’m working in Erbil this week among the refugees in Kurdistan, I’m also monitoring developments in Hassake in northern Syria. It’s estimated that that about 1,300 Assyrian/Chaldean/Syriac families have been displaced from Hassake and have fled to the nearby city of Qamishli. Most of them are being housed in churches, schools, and monasteries; some are in the homes of host families. A number of other families have fled to the towns of Tel Tamer and Derbassiyeh. In the wake of the latest attack by ISIS on Hassake city on Wednesday 24 June, the terrorist organization was able to gain control of the Al Nashwa neighborhood south of the city. Clashes are still ongoing between members of ISIS and government forces backed by militias. It’s not accurate to say that the situation is similar to what happened in Mosul — mainly because the fighting is still going on and it is fierce; in Mosul, the area was occupied without any local resistance and without any real fighting. In Hassake we have different parties involved in fighting ISIS. In addition to the Syrian regular army, the Kurdish fighters and local inhabitants of Sunni Arab nomad clans (al Shouaytat family) are also fighting on the side of the Syrian troops. This Sunni clan is one of the largest in northern Syria. Last year, they lost about 925 young men. The men opposed ISIS occupying their region, and the militants executed them all within three days. CNEWA has already rushed funds for the displaced Christians of the city, and is working with partners on the ground to respond to the growing needs of the families in flight. To learn how you can help, click here. Picture of the Day: What's on TV? Pope Francis chats with retired Pope Benedict XVI during a meeting at the Vatican on 30 June. Pope Francis on Tuesday morning visited Pope Emeritus Benedict XVI at his residence, the former Convent Mater Ecclesiae, in the Vatican, to greet him and wish him a pleasant stay in Castel Gandolfo in the Roman hills. The meeting lasted about half and hour. The director of the Vatican Press Office, Father Federico Lombardi said the Pope Emeritus transferred to the summer retreat earlier today and will remain there for the next two weeks. He is scheduled to return on 14 July. 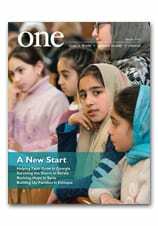 We’re pleased and proud to report that CNEWA’s multimedia magazine ONE took home top honors at the Catholic Press Association awards dinner Friday. The magazine won 12 awards — including First Place for General Excellence — at the Catholic Media Conference in Buffalo, New York. “First rate journalism. Consistently strong reporting and research, not simply quotes and descriptions. Any one of the news features in a given issue could easily have been a cover story. Great job of putting the reader in far-flung places. … Outstanding. Archbishop Mieczyslaw Mokrzycki of Lviv, Ukraine, and Father Andriy Lehovych show Archbishop Joseph E. Kurtz of Louisville, Kentucky, president of the U.S. Conference of Catholic Bishops, and Msgr. J. Brian Bransfield, USCCB associate general secretary, the poor conditions of a Ukrainian seminary in Lviv on 22 June. The building was confiscated by the former Soviet regime, but only a small chapel in the structure was returned to Roman Catholic officials after Ukraine gained its independence in 1991. Read more about the bishops’ visit to Ukraine at this link.